Grimlock is narrating events as he did in the previous installments, again John Barber gives us the more pragmatic and mean incarnation of Grimlock, before the vocal inflections of his animated incarnation became intertwined with his more intelligent comic portrayal. He’s recapping on the purpose of Swoop’s mission, and the background behind it. While we see a tank trundling over terrain into hostile territory before transforming and revealing through the artist’s rendition and the narration that we are getting to see Swoop. We get a non aerial changeform for Swoop, which is a first and an unusual step, but actually makes sense when you think about the Lightning Strike Coalition/Dynabots/Dinobots. Swoop was always the weaker one in a raw powers sense – yes the flight gave him some advantages but he was really lagging behind the more heavily armoured of his teammates. Special note should be made of the mid transfomation image in panel 4 on page 1. It bears a remarkable resemblence to the transformation in the live action movies – specifically Ironhide’s in the first film where he leaps to dodge a missile in Mission City. It’s an unusual choice and works well. Shockwave’s comic portrayals have drawn heavily on his logical thought processes, but many have made the assertion that this is not as slavish a devotion to logic as Shockwave would have everyone believe. IDW’s Spotlight: Shockwave doing a fine job of that, but go back further to say Marvel UK’s portrayal of Shockwave, who when his leadership was threatened by Galvatron became ever more irrational. But I digress, we get back to the story and hordes of Insecticons appear and Shockwave is adamant that they will be key to the Decepticons victory, with Starscream less convinced and threatening to report back to Megatron. Swoop is watching all of this unfold, and Shockwave apparently sees him, looks straight at Swoop’s position but makes no reference to it in his dialogue and continues his exchange with Starscream. Swoop does his best to scramble away, unsure if he has been spotted by Shockwave, although this becomes an irrelevance when he runs into a horde of Insecticons. In the face of overwhelming odds, Swoop deploys a humourous quip and the far more effective Energon Swords and starts to try and cut his way through the Insecticons. At this point Grimlock’s narration kicks back in as we see Swoop being overwhelmed, he starts to broadcast his message (as we saw in Issue 1). The final page cuts away and we see the four remaining members of the LSC making their way towards Swoop’s location, revealing through the narration that Swoop’s transmission gave them the location of this Decepticon base. Grimlock again states that the energon will turn the tide in the war and he knows what Prime would do with this intel, so it’s a good thing that it’s intel he possesses. The story ends there, but the issue itself doesn’t as we get a preview of a few pages from the Fall of Cybertron artbook looking at The Ark and Bumblebee. The art is great and the text is interesting enough. Now not owning a pc or a games console I have no real interest in the games, but the artbook is something I might just spring for. So the second issue, is in effect the second half of Act One, we get to know what has happened to Swoop and some hints as to the main threat of the remaining issues. At this point it looks like Shockwave and the Insecticons, that could still be the case, but I think John Barber might have a few more surprises for us. As I said in my last review, this comic feels like it could slot into any number of Transformers continuities and not feel out of place. 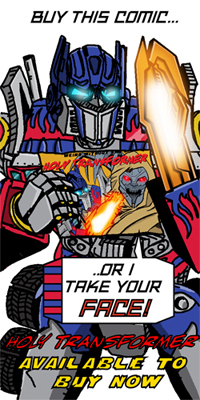 I still think it’s a great fit for Marvel, especially given John Barber’s portrayals of Grimlock, Swoop and Shockwave. I’m still enjoying the art, the storytelling is fantastic throughout – clear and easy to read, interesting choices of angles and shot composition to keep the reader engaged and the heavily scratchy inks give it a wonderful look. It’s one thing I have to commend IDW on, every one of their Transformers books on the shelves/digital storefront right now has a unique look and feel to it. There is something for everyone at the moment. Long may it continue. I know this is only a 6 issue mini, but based on what we’ve been treated to so far a return to this world, by the same creative team would be no bad thing.